The global smart meter market is estimated to reach $10.4bn by 2022, driven by rising emissions, domestic energy resource constraints, ageing infrastructure and the growing demand and cost of electricity, says GlobalData, a leading data and analystics company. 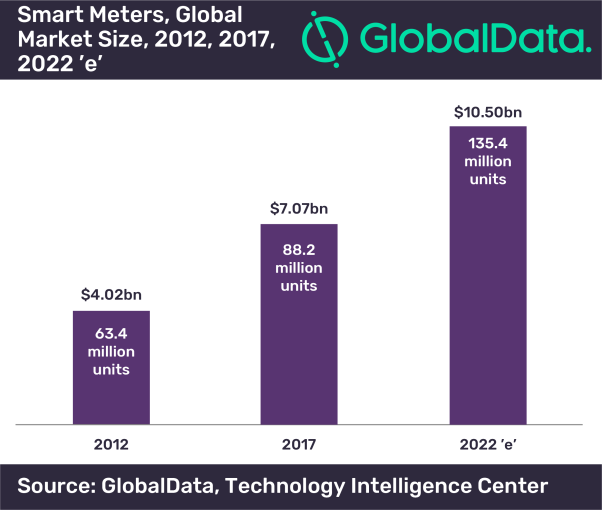 GlobalData’s latest report, ‘Smart Meters, Update 2018 – Global Market Size, Competitive Landscape, Key Country Analysis, and Forecast to 2022’, reveals that nearly 88.2 million installations took place in 2017 where global market value reached $7.1bn. Between 2012 and 2017 global market volume achieved a compound annual growth rate (CAGR) of 6.8% with value achieving double digit CAGR of 12%. Nations such as the US, South Korea and Japan have issued legislation, targeting 100% market penetration for smart meters. Consequently, the development and large-scale use of renewables, energy management technologies and efficiency measures are expected to contribute to the projected smart meter market growth. Market drivers during GlobalData’s forecast period will include, evolving information and communications technology standards, the replacement of outdated meters (both advanced metering infrastructure and traditional), new infrastructure development, and peak load and asset management.